TJ was feeling like a second class citizen in life. Most of her life she has felt this way with her family. Recently she had been feeling this in her primary relationship as well. We grounded TJ and called forth the beings of light, Archangels, Ascended Masters and the Divine Feminine energies to assist us in clearing and healing this long term energy. Tapping the HPT points to come into balance TJ felt ready to dive into this energy. TJ’s mind needed the energy of compassion in a soft powder blue color; there was also a “shadow” energy in the image of a head and shoulders. Chanting An Nur 15 times this brought the energy rating down to a 1. With the topic of concern I was guided to tap into the inner critic to release old beliefs that may be blocking her good from flowing to her. TJ wrote out a list of the inner critic mind chatter. Tapping on the HPT points we spoke to the inner critic, telling it to take a hike! Shut up and to go jump in the lake. While tapping on the consolidation point we told the inner critic it no longer had any power over TJ. TJ’s rating dropped to a zero on items 2, 4 and 6. Number 1. dropped to a 2 rating. Number 3. dropped to a 1 rating and Number 5 to a 4 rating. Ahhhh ‘Stupid’ a word that TJ had shared was an “illegal” word in her adult life. Yet there was still some energy around it. I asked TJ where she was feeling the 2 rating of “Unworthy of love”. TJ felt this in her heart and needed compassion in the form of a red cylinder. The 1 rating of number three was in her head and needed “understanding – the knowing of understanding”. The 4 rating on the energy of Stupid was in her shoulders (interesting how shadow energy showed up as a head and shoulder in the previous exercise.) TJ’s shoulders needed a cooper colored iron rod, full of hugs and the sound of something hitting an anvil. Having TJ hold the HPT pose I saw Mother Azna, Mother Mary and Durga Mata come forth to assist her healing. Chanting An Nur several times I saw Durga Mata come forth on her tiger, wielding her sword, cutting away all the cords that were bound. The energies needed, flowed easily down into TJ’s head, shoulders and heart. I love it when Divine Mother assists! This was powerful energy. TJ share that all ratings where now a zero. Feeling some past life energies intertwined with this issue, TJ help the pose and we asked if there was a doctrinal gatekeeper. TJ saw this as a feminine energy that was holding onto the fear of the unknown and lacked understanding. The gatekeeper felt it was protecting TJ in some way as she moves more fully onto her healing path. Showing the gatekeeper that TJ had a sparkly clean heart and claiming she only has good and pure intentions of the heart, the gatekeeper shifted. TJ saw the gatekeeper’s heart and the radiant God light within. The gatekeeper played with the light, juggling it around, as if she was re-mixing the light energy. She then gave TJ a blessing and was gone. Her parting words were “Go for it”. The release of the gatekeeper opened the door to clear some past life persecution energy. 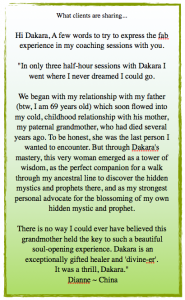 TJ’s time line popped up, she was taken back to a life time where she was persecuted for performing her healing work. As she observed herself, she felt the fear of how others would not understand. Chanting An Nur we called forth the energy of divine forgiveness, this showed up as a warm honey yellow energy, thick and yummy. The golden energy poured down onto the time line filling TJ past life being with love and forgiveness, until all that was left where the healing gifts she had in that life time. TJ gathered those gifts in a basket as we sent the golden energy all the way down the time line back to the present moment. As TJ traveled back to the present moment, she gathered many spiritual gifts of healing from other life times and felt powerful as she shared the honey energy with other lives where she had been persecuted. Once back above her present moment body, she took 3 deep breathes to anchor in the energies and gifts and simply dropped back into her body. Tears streamed down her cheeks. TJ now felt the love and understanding she had been seeking. Mother Mary came forth with a blessings message for TJ. Beloved Daughter, know that your heart is true, and although you have always known this, know that it‘s safe to share that truth with others. There is understanding for you this life time. There is understanding in all things. Understanding yourself first is key, understanding the truth of who you are, who you are meant to be this life time. You are discovering this more and more everyday as you walk your journey as healer. Be one with nature beloved one, be peace and know the truth in your own heart. And so it is! TJ shared that she no longer felt any energy around being a second class citizen. TJ has come home to her own heart, with new gifts and energies. She feels ready to step onto her path in a new way, filled with hope and inspiration!